It is one of the beauty spots of Casco bay and also one of the coolest and most picturesque places on the Maine coast. An ideal place for your summer vacation, giving one the combination of country and sea shore. The personal attention of the proprietor is given to all cooking and service. Rooms can be had in the main house, in the annex, or in tents on the lawn, which are furnished as rooms with wooden floor, etc. Three meals daily. Telephone in house Terms for board and room on application. R. F. D. No. 1. Note: This was one long postcard, with the top picture on the left, the middle in the center, and the bottom on the right. Old Fort Homestead was owned by the Stover Family. This was originally an Indian fort. The house was passed down through generations of Stovers always with lots of children and each time excess guests showed up they would add another room eventually totaling 18 rambling from the main farm house plus the annex and at one point provided tenting platforms for the outdoors type. They were noted for various types exciting entertainment all summer long. Even when it was raining or foggy, they all had a good time. 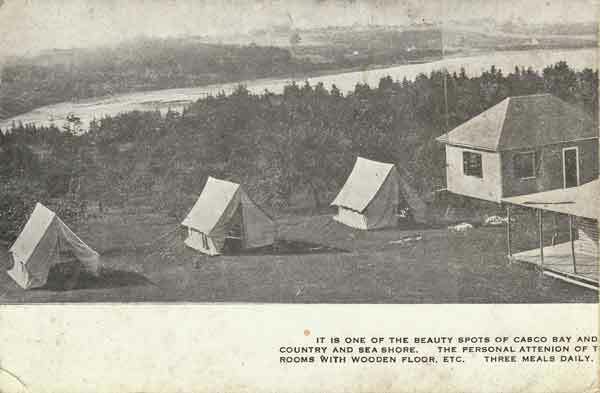 The Stovers set up for formal rentals in 1906. 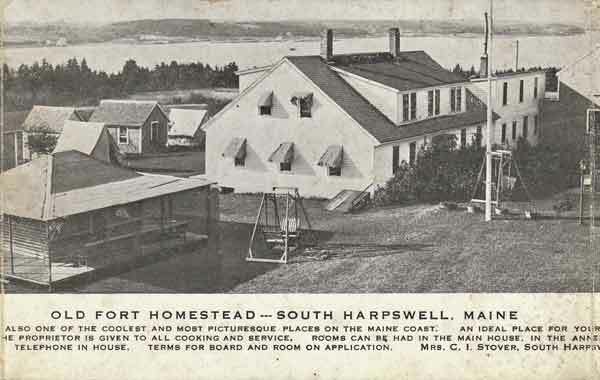 They advertised summer rentals in 1909 , the original farm house burned in1921 and the original old fort burned in 1926.